Wizzair flight 6772 from London Luton to Cluj-Napoca has landed. It is Friday, 23 October 2009, 1:00 pm EET. Low-cost flights are cheaper if you travel light, so I exit the airport quickly. I am looking for an exchange office to convert some pounds into lei for a cab to the city. Although Cluj airport is international, there are none. I find a cash machine, the only one, I work out the money issue and go to the taxi rank. The first driver refuses to take me, the hotel is too close he says. The second takes the risk, even if he does not know where King Ferdinand Street is. After a second thought he remembers: the street has been renamed after the 90s, as well as the Transylvania hotel. We leave. On the way we discuss politics, without seat belts: three weeks ago the Romanian government collapsed, sending the country’s currency into decline and more than half of the 1.4 million state employees on strike. The signs of the crisis are everywhere: out of business stores, deserted construction sites, slapdash architecture and roads. Time appears here to be a prisoner of its allegory, space. A coloured space, however, particularly as we get closer to the centre: from dusty concrete to shiny long steel, from overground yellow gas pipes to black criss-crossed cables in the air, all luxuriantly freshened by an ‘everything is possible’ type of signalling. Cluj is the place to be these days if you are in the art business in this part of the world. 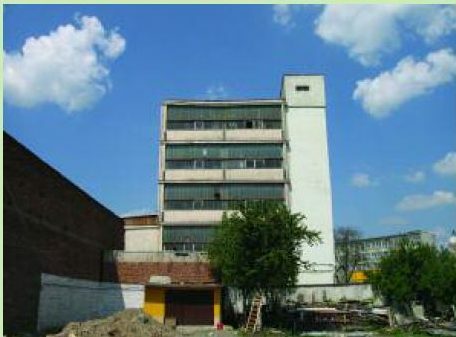 Tonight it is the opening of the Paintbrush Factory (Fabrica de Pensule), the first disused industrial building to be reborn as arts complex in post-communist Romania. The project is initiated by a group of artists, curators, cultural managers and producers, determined to challenge the local community and to underpin the city’s place on the international art map. The centre gathers 29 independent art spaces on a surface of 2000 sqm: artists’ studios, galleries, contemporary dance, concert and theatre halls. The factory is owned by a local young businessman who let out the space for five years, at an affordable price. At the beginning of spring, artists moved in and started to work with bricks and mortar, their own logistics and financial resources. The result is 4 storeys quality art: Sabot, Cluj Est, Plan b, Laika and Zmart artist-run galleries; independent cultural organizations AltArt, ArtLink, GroundFloor Group, ART-HOC, Grupa Mica, Arta Capoeira and Pillar Association; artists’ studios: Radu Comsa, Cristina Gagiu & Attila Gräff, Ciprian Muresan, Serban Savu, Cristian Rusu, Miklós Szilárd & Miklósi Dénes, Maria Brudasca, Bogdan Rakolcza, Adi Cimpoesu, Ciprian Bogdan Adrian, Mihai Radu Gui & Raluca Onti, Adrian Ghenie, Marius Bercea & Smaranda Almasan, Denisa Curte, Jennifer Delplanque & Marius Nedelcu, Irina Dumitrascu, Claudiu Iurescu, Belenyi Szabolcs, Atelier Robert Bosisio & Sabot, Atelier Quadro Portfolio. The space keeps the raw appearance of the former factory, echoing the surroundings and the ideas of work-in-progress and history in the making. Hundreds of people, most of them students at the ten universities in Cluj, pack the space during the opening night and I can tell this place is their long-awaited Mecca. In a context in which the art infrastructure, public and private, is sublime but totally missing, the Factory indeed makes a difference. It is the first multi-functional and multi-disciplinary centre designed to propose discourses addressing recent history and community issues, to update knowledge, and secure continuity with what is happening on the international scene. To count just the highlights of the projects going on, I would mention Alex Mirutziu’s ‘Manifest of Flaw’ at Sabot Gallery – an exhibition that reflects on the physical, political and social body in connection with the prohibition of gender issues in Romania; Ciprian Muresan’s exhibition Luv at Plan B gallery, which addresses the flow of art history and its mechanisms of inclusion and exclusion; Tom Chamberlain’s ‘Clockwise From the Left’ at Laika Gallery – a sequence of mono prints and abstract watercolours exploring the slow process of revealing the image; ‘Who am I? / Where do I come from? / Where do I go?’ show at Zmart Gallery, with fashion design and photography artists Lucian Broscatean, Ramona Gliga, Rinad Muti and Stefana Zdrenghea questioning their identity in the global village; Mircea Florian’s performance ‘Origin’ – an improvised music reading of Tao Te Ching classic text; ‘Message’, a multi-reality-dance-show at the GroundFloor, concept and choreography by Sinkó Ferenc; ‘A Soul for Europe – Forum Cluj. Culture and Urban Development debate’ on the potential of contemporary culture to influence education, social and economic development, organised by AltArt & A Soul for Europe; and ‘TEMPS D’IMAGES’ theatre, dance and video Festival, organised by ArtLink. The diversity of the programme proves that the member organizations of the Paintbrush Factory pay close attention to new forms of artistic expression, helping out with the emergence and professionalisation of young artists who are motivated by and utilise the new skills and technologies of the current cultural production. In Western Europe in the early eighties, centres of this type, established at the heart of former industrial or commercial spaces whose original functions have been redirected towards artistic creativity, were still only unusual experiments, often considered marginal. After the nineties, similar approaches began to multiply and are still multiplying all over Europe, in answer to the growing demand which younger generations have expressed for intermediate, flexible, liveable spaces. Factories, warehouses, covered markets, dairies, slaughterhouses or barracks are remodelled into open spaces. ‘Fabrica de Pensule’ is the first Romanian initiative that joins the network, defying the local economic constraints and providing an alternative to existing moribund art institutions. And I am 100 per cent positive that next time their sign will welcome me at Cluj airport, hopefully next to a brand new exchange office. Download the original article here.